Everyone loves a hero, but even better is a pit bull hero! And Red is a pit bull hero! When Red was 7 years old, his world was changed forever. He was at home when someone broke into his home and robbed his owner at gunpoint. The robbers started beating up Red’s owner, and Red was quick to come to his owner’s defense. Unfortunately, in the struggle, Red was shot. Eventually, police came and saw Red there, lying on the floor. When they realized that he was still alive, they called animal control to help poor Red. Red was stabilized but would be paralyzed for the rest of his life. To make matters worse, his owner was in intensive care and was severely injured as well. Due to the owner’s injuries as well as the dog’s paralysis, he would never be able to care for Red again. The Chicago animal control facility did all that they could for Red, but what next? Where would Red go? This is when PAWS Chicago stepped in. 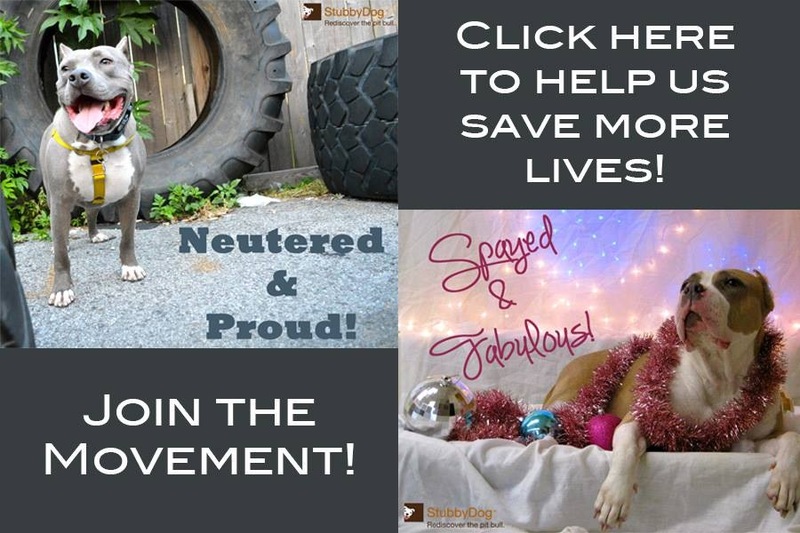 They would help this pit bull hero find a forever home. Red was transferred to the PAWS Chicago facility where he attended physical therapy and was cared for by their veterinarians. His perseverance was admired by the staff and volunteers. The volunteers chipped in and bought Red a wheelchair. Red started going on daily walks around the neighborhood and quickly became a local celebrity. He made trips to nursing homes to visit with the residents there. Red and his ability to overcome his disability were an inspiration. 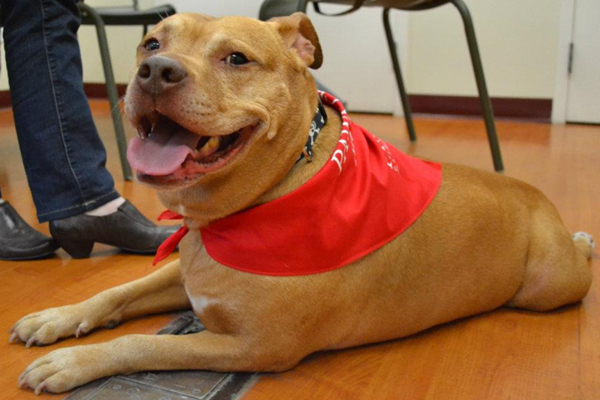 As one volunteer put it, “To me, Red represents all the good that an animal can teach humans – acceptance, overcoming adversity and trust, even when that trust is violated.” Still, what Red really needed was a home. Then, after two long years, it happened! 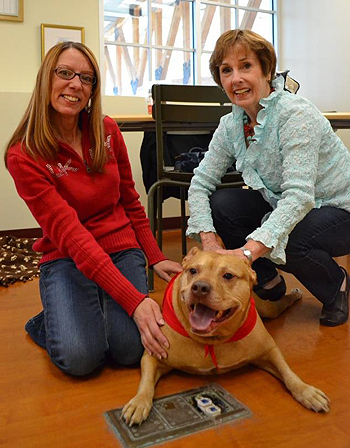 On April 22, 2012, Red was officially adopted! Congratulations to Red and his new forever family. I read Red’s story a couple of weeks ago and cried & today again I shed tears for this courageous boy. He looks happy & an inspiration he is! @theprettychic It’s a tear jerker for sure, but he’s in a loving home now and you’re right, he’s an inspiration! What an incredible story. I’m glad Red has officially been adopted and has found freedom from his paralysis (I usually only see those carts on dachshunds!). I hope he’s happy and well-loved for a long, long time. What a great story of perseverance & hope! Red, you are incredible. What a great story of perseverance & hope! Red, you are incred-a-bull! @Matt.S Well said Matt! thanks! YAY!!!!!!!! I’m so happy Red found a happy home. I heard of his story and then visited him when he was at Paws. I burst into tears immediately upon seeing him. What a sweet, brave, wonderful, gorgeous dog. 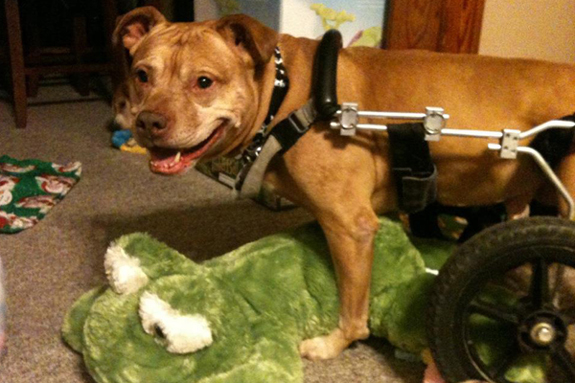 What an inspiring story, and an even more inspiring pup! I’m so glad he got the forever home he so desperately deserves! With a family who will love him every bit as much as he will love them!